Doctor of Science (Entomology) - University of Pretoria, South Africa, Dept. of Entomology, 1987 - Dissertation: Systematics of the Afrotropical Coraebini (Coleoptera: Buprestidae: Agrilinae) and their relationships within the family. 630 pp., 325 figs. Master of Science (Biology) - California State University, Long Beach, Dept. of Biology, 1983 - Thesis: A revision of the genera Nanularia Casey and Ampheremus Fall (Coleoptera: Buprestidae: Chalcophorinae). 83 pp., 25 figs. Bachelor of Arts (Entomology) - California State University, Long Beach, Dept. of Biology, 1979. Undeclared double major: entomology and botany. Special Two-year Postdoc - National Museum of Natural History, Smithsonian Institution, 1989-1991. 50% time: specimen preparation, leaf-mining buprestids & database creation; 50% time: personally elected research. Systematics and phylogeny of Coraebini (Coleoptera: Buprestidae: Agrilinae). Phylogeny and biogeography of Buprestidae, especially higher classification and familial outgroup questions. The Coraebini of Madagascar (see discussion below). The Buprestidae of Mexico (see discussion below). Higher Classification of Buprestoidea based on molecular data (see discussion below). Teaching Assistant at University of Pretoria (1986). Graduate Assistantship, California St. Univ., Long Beach. 1979-1981. Field Associate, Natural History Museum of Los Angeles County. 1983. 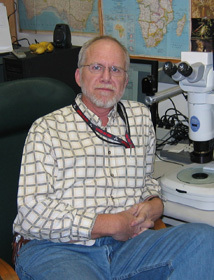 Research Associate, Florida State Collection of Arthropods. 1984. Research Assistantship, Univ. of Pretoria, 1984 - 1987. Doctoral Research Bursary, South African Council for Scientific and Industrial Research, 1983 - 1987; full scholarship supported tuition and most living expenses. Adjunct Professorship, California State Univ., Long Beach. 1987-1989. Research Associate, San Diego Society of Natural History. 1987. Visiting Scientist Stipend, National Museum of Natural History, Smithsonian Institution, 1988. Visiting Scientist Fellowship, Zoological Institute, Soviet Academy of Sciences, Leningrad, 1990. Research Opportunity Fund, National Museum of Natural History, Smithsonian Institution, $2700 awarded to support matching funds for travel to Russia and Czechoslovakia, Winter 1990. Research Opportunity Fund, National Museum of Natural History, Smithsonian Institution, $1000 awarded to support field work in Malaysia, Summer 1990. Malaysian Field Trip supported by my senior collaborator, G.B. Vogt, $3000, Summer 1990. Research Opportunity Fund, National Museum of Natural History, Smithsonian Institution, $1200 awarded to support field work in south central Mexico, Fall 1990. Coordinator, Field Guide to Costa Rican Buprestidae, Instituto Nacional de Biodiversidad de Costa Rica (INBio), support limited to travel and publication costs. Research Associate, Carnegie Museum of Natural History, Pittsburgh. 1992. Visiting Scientist Stipend, U. N. A. M., Mexico City. 1996. Visiting Scientist Stipend, National Museum of Natural History, Smithsonian Institution, 1997. Ernst Mayr grant, Museum of Comparative Zoology, Harvard University, 2004. TWiG leader (Buprestiodea), Beetle Tree of Life project, National Science Foundation, 2005-2008. 1995 National Research Foundation (NRF, Pretoria, South Africa): Rolling Research grant. 1997 - 2002 NRF: Sustainable Environment: Biodiversity - Phylogeny of southern African Buprestidae, including Madagascar - first three years complete. 2000 proposal amended to concentrate on Madagascan Coraebini. 2000 NRF: Sustainable Environment: Biodiversity - Molecular systematics and higher classification of the beetle family Buprestidae (Coleoptera). Extensive field work in southwestern U.S., southern California to west Texas - (1972 - 1983; 1987 - 1994). A complete list of publications with links to PDF copies of most can be found here. Consultant, Beetlemania, (1995) Green Umbrella Pictures Inc., United Kingdom, 49 minutes. Consultant, Chitinous Shields Forever, (1996) Talking Pictures, Johannesburg, 26 minutes. Bellamy, C. L. The World Catalogue: Problems, Format and Progress. Proceedings of the First International Symposium on Buprestidae, Visegrád, Hungary, Sept. 18-23, 1995. Bellamy, C. L. The Subtribe Coroebina: Past, Present and Future. Proceedings of the First International Symposium on Buprestidae, Visegrád, Hungary, Sept. 18-23, 1995. Bellamy, C. L. The Present State of Knowledge on the Ethiopian Buprestidae. Proceedings of the First International Symposium on Buprestidae, Visegrád, Hungary, Sept. 18-23, 1995. Wieczorek, A. M., Wright, M. G., Bellamy, C. & Channing, A. An investigation of possible host-plant differentiation in Sphenoptera spp. (Coleoptera: Buprestidae) from Proteaceae using molecular and taxonomic approaches. Proceedings of the Joint Congress of the Entomological Society of Southern Africa & African Association of Insect Science, Stellenbosch, South Africa, July 1997, p. 193. My research goal is to produce the most modern, empirical classification and accounting of the Buprestidae, via traditional and modern techniques and procedures, e.g. morphological systematics of adult and immature character states; molecular systematics; web, hardcopy and CD Rom publication of world catalogue and regional checklists. Following four visits to the Paris Museum, I have completed the foundation work for the large project on the Madagascan Coraebini. Having seen almost all of the types of existing taxa, the original estimates of 20-30 new genera and 500-600 new species are accurate and represent at least a ten year project. A limiting factor is the slowness of the Paris staff in responding to my loan requests, as it is actually quicker to visit and return with the material I need. A catalogue of all described species is prepared; the first generic groups have been identified and material is being gathered for the first descriptive papers. The majority of the specimens were first collected by Cerceris wasps then later dug from the wasps’ nests by French entomologists. A possible collaboration with a hymenopterist is apparent. The completion of this large descriptive work will allow phylogenetic analysis for the entire Afrotropical component of this largest and most diverse tribe in the family. The Subsaharan portion of the group was the subject of my doctoral thesis. A new collaborative project to catalogue the Mexican fauna of this beetle family through extensive field work and systematic studies. In concert with personal research interests, those of colleagues and several interested Mexican coleopterists, this project might represent a true binational attempt to deal with the diversity of one relatively rich family of beetles. Funding to support this project will be sought from several sources upon approval by Mexican authorities and the receipt of collecting and export permits. This project may evolve into a Coleoptera of México larger scale effort with more attention to a bigger collaboration underway. 3. Molecular systematics and higher classification of the beetle family Buprestidae (Coleoptera). Since late in 1997, I have been collecting fresh specimens from a variety of well-known taxa and applying genetic preservation techniques during field work in southern Africa, southwestern North America and central Mexico, and Australia. A number of colleagues have generously collected fresh specimens in their travels, eg. Chile, Australia, Indonesia, New Caledonia and Central Europe. All of this fresh material has been preserved for DNA extraction and is stored appropriately in the molecular systematics laboratory at NHMLAC. I have material of nearly 300 taxa representing both families of the superfamily Buprestoidea, all subfamilies and tribes of Buprestidae, 43 of 64 subtribes, including most of the crucial taxa and several important outgroups. The project will be collaborative between myself and the laboratory of Dr. Brian D. Farrell, Museum of Comparative Zoology, Harvard University (details) and Dr. Farrell’s PhD student Amanda Evans. We will begin preliminary work on the origin of leaf-mining in the Buprestidae and later propose collaborative work which will generate sequence data on this fresh material for comparative parsimony analysis which, when combined with morphological character states, should allow the most modern interpretation of higher relationships within the superfamily as well as help provide the definition of sister group.